“`These are distilled out of a California craft brewery from the Humphrey Bogart Estate and Patron Tequila’s co-founder John Paul DeJoria ROK Spirits. Of all the gin, rum, vodka, and whiskey… in all the towns; in all the world. Smooth in nature; complex in character; abundant in taste; and smartly bottled. 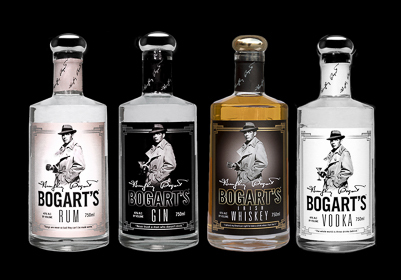 Bogart’s is the brand that would have made a film star proud. Quality brew in the spirit of Casablanca. You will enjoy every drop… As Time Goes By. “`Before Frank Sinatra, Humphrey Bogart was the original center of the legendary Rat Pack. Bogie always said the whole world is three drinks behind. This entry was posted on Tuesday, March 13th, 2018 at 12:53 am	and is filed under Blog by Manny Pacheco. You can follow any comments to this post through the RSS 2.0 feed. You can leave a response, or trackback from your own site.